The wine-friendly machine-made red wine glass of the glass collection Ouverture radiates pure elegance, for utmost enjoyment and is perfect for business. 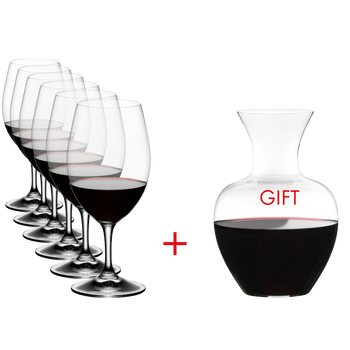 This multifunctional red wine glass is shaped to enhance the aroma and flavor of all aromatic wines. It is RIEDEL's uncomplicated entry level series for customers who appreciate good reasonable priced wine. OUVERTURE is RIEDEL’s entry level series for customers who appreciate good, reasonably priced wine. OUVERTURE is a nonvarietal specific collection, of ten fine crystal glasses, that will increase the owner‘s drinking pleasure of wine, beer and spirits.